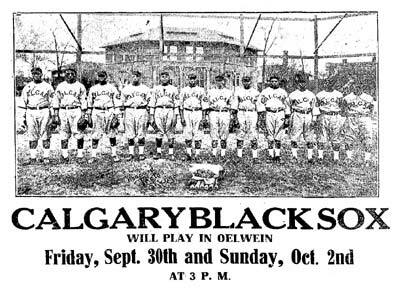 There's the curious case of the Calgary Black Sox, a barnstorming team of black players in the early 1920s. It appears the team may have little to do with the Alberta city in spite of the "Calgary" emblazoned across their uniforms. The team appears to have been based in Chicago. One clipping does refer to the Calgary Black Sox of Chicago. The team photo, left, carries a notation that it was from a Chicago photo studio. In the late summer of 1921, Alberta amateur baseball officials took action against the Sox. A note in the Albertan (August 1, 1921) provided an explanation for the Calgary affiliation. "... derive their name from the fact that the club is owned and controlled by Charlie Ross of this city. The players hail from various cities in the United States, although when playing across the border they had quite a laugh on the fans by telling them they they hailed from Calgary." (July 25) Moose Jaw had an easy time in downing the visiting Calgary Black Sox 10-3. Oscar "Lefty" Vold allowed but seven hits in going the distance for the win. Catcher Gates paced the attack with two doubles and a triple. "Cec" Browne added a triple and two singles. For the Sox, Reed had three hits, including a double and a triple. The game attracted a crowd of about 1,000, the largest at the Exhibition diamond this season. (July 26) A second contest between the Black Sox and Moose Jaw was washed out by rain. (July 27) The barnstorming Calgary Black Sox (out of Chicago) downed Swift Current, 7-2 and 9-1, in a twin-bill in the Saskatchewan community. Walters of the Sox, held the locals to five hits to take the pitching decision in the first game. Jimmy Borthwick gave up just eight hits in a losing cause. Bobby Boyd of the visitors and Borthwick clubbed homers. Scottie Hendrix allowed just two hits as the Black Sox took the second game, 9-1. Reid and Lynch belted homers. (August 1) Waldo defeated White Spruce 10 to 8 to capture top money in the long-delayed final game in the Fernie Dominion Day tournament. Originally billed for July 1, the game had been put on hold for a month after poor weather conditions forced a postponement. Gamblers were evident throughout the large crowd and it is estimated that upwards of $3,000 changed hands over the result. (August 3) Estevan captured top money at the Weyburn Tournament defeating Moose Jaw 2-1 and then Weyburn 4-3. Following this success, Estevan went on to the tourney at Stoughton carrying a record of 22 victories in 25 games. (Aug 04) First baseman Vanderbilt Meyers bashed a homer over the right-field fence in the 8th inning to give the Calgary Black Sox a 6-5 victory over the Drumheller All-Stars in the first game of the four-game series. Right-hander Frank Wickware bested Lefty Hartman to gain the pitching decision. Drumheller took the lead in the opening frame on a walk to Hartman followed by Newhouse's double and Mike Moran's single. The Sox came right back in the bottom of the first to tie at 2-2 on singles by Bobby Boyd, Reed and Anderson and scored three in the 5th on a double by Duncan, single by Lynch and three errors. Back came the All-Stars in the 7th as Red Dutton doubled to left and Con Bessent reached on an error. Both scored on an overthrow to second. The tying run scored on an error following singles by Hartman and Newhouse. (Aug 05) Calgary Black Sox held off a Drumheller rally in the 9th to shade the Miners 4-3. Trailing 4-1, Fred Schroeder's single scored Dodger Lewis and Con Bessett before reliever Scott fanned Newhouse to end the game. The contest featured a pitchers' duel between Dodger Lewis and Avery. Each gave up just six hits. Lewis allowed just one earned run. He fanned nine and walked none. Avery fanned three and walked two. Bobby Boyd of the Sox was the offensive star with three hits, one a triple, and two runs scored. (Aug 06) Calgary Black Sox took a pair from Drumheller, 7-4 and 10-7 to sweep the series with the Alberta nine. The visitors pounded out 18 hits in the opener, four by left fielder Bobby Boyd. Winning pitcher Scottie Hendrix belted a homer. Mike Moran had four hits for Drumheller. In the second game, centre fielder Lynch punched out two triples scored three times for the Sox. (August 09) The Central Alberta All-Stars, representing Innisfail, shocked the barnstorming Calgary Black Sox at Victoria Park Tuesday downing the visitors 7-2 after going six innings without a hit. The Sox took a two-run lead in the 2nd inning on singles by Lynch, Morman and Vanderbilt Meyers, a sacrifice and an error. Bobby Boyd blanked Innisfail into the 7th inning when Willard reached on an error and Ernie Sarlund clouted a homer, the first hit for the All-Stars, to deep centre. The locals put the game on ice with a five-run outburst in the 8th. The big inning featured singles by Fitzgerald and Willard, walks to Vaughan and Walker, a sacrifice by Mike Moran and two errors. The Sox out-hit Innisfail 9-3. Walker went the distance for the win compiling 11 strikeouts and just one base on balls. (August 10) Calgary Black Sox whipped Innisfail 12-1 and 12-8 in the final two games of the three-game series. The Sox pounded out 15 hits and take advantage of eight errors. Frank Wickware scattered ten hits to go the distance for the win. In the second game, the Black Sox scored three in the first inning and coasted to a 12-8 victory in a game which saw each team commit seven errors. Innisfail put a scare into the visitors in the 8th, scoring five times. The Sox clouted 16 hits, double the total of the host team. (August 13) Scottie Hendrix fired a three-hit shutout to lead the Calgary Black Sox to a 9-0 decision over Red Deer. Hendrix had five strikeouts and one base on balls. Lynch led the offense with two hits, one a double - the only extra base hit of the game - and scored a pair. Anderson and Reed each had a pair of hits. Peterson hurled for the locals, giving up 11 hits while compiled 11 strikeouts and three walks. (August 15) The Black Sox rallied for two runs in the 8th inning to down Red Deer 5-4 in the second game of their exhibition series. Bobby Boyd was the pitching and hitting star of the game. He held the locals to six hits while belting a triple, double and single, scoring two runs and even stealing a base. Duncan, Lynch, Anderson and Meyers each had two hits for the Sox. Third baseman Fadden had three hits for Red Deer. (July 07) Joe Johnson was the whole story as Plumas won top money at the Arden, Manitoba, Sports Day. Johnson fired four consecutive shutouts. He beat Wellwood 2-0 in the opener. In the second round, Bert McDougall belted a grand slam homer to give Plumas a 4-0 win over Maple. Johnson fired a third shutout in a 3-0 win over Arden in a semi-final and then was back on the hill for the final, a 2-0 victory over Eden in a game which went just three innings, ending because of darkness. Alfred, Johnson's battery mate, slugged a homer, the longest seen at the field all season.